My lil one is 6 months and my group 0 car seat seems lil snug on her.. Would I be best to get one of these all through ones and would they be as good and safe as a maxi cosi for example? My lil one is 6 months and my group 0 car seat seems lil snug on her.. …My lil one is 6 months and my group 0 car seat seems lil snug on her.. Would I be best to get one of these all through ones and would they be as good and safe as a maxi cosi for example? Pretty sure I’m right in saying that littles need to remain rear facing until 15months with latest regs and recommended as long as possible. Provided your little isn’t too heavy or too tall for your group 0 seat then best to stay in this until they actually out grow it, snug isn’t necessarily bad! You can drive yourself nuts searching for car seats, we used car seat safety centre in mk who were great. Have them all on display, test fit them in your car and can try little one in it too. Thoroughly recommend them (think there are a few centres around the country) you need to book an appointment btw. None of the seats available in Asda allow rear facing beyond 10kg, so they aren’t suitable for a 6 month old. To get the most out of your current seat make sure you’ve removed all the extra padding that you can and when you put your daughter into the seat pull her bottom forward so her nappy is right up against the crotch strap. When her head becomes level with the top of the seat, or she reaches 13kg/28lbs the seat is outgrown and you need to buy her a bigger rear facing seat. 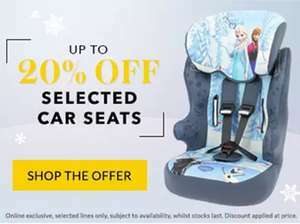 Forward facing before the age of 4 is the least safe option, I know it’s the ‘normal’ thing to do in the uk, but please do some research about extended rear facing for yourself before you buy a forward facing seat for your daughter. Do not rely on what you are told by the sales staff in high street shops - do your own research or go to a specialist retailer like the In Car Safety Centre mentioned by someone above.